Last week we had the chance to test the new menu of Jamie's Italian in George Square, the occasion being not one, but two family birthdays. I'd been in the past but not in a long while so it was an ideal opportunity to enjoy some good food in town. There's lots to like about Jamie's Italian. It's a large restaurant yet manages a really cosy atmosphere. The decoration is a feast to the eye too, simple yet appealing, with lots of wood and food items as well as cooking utensils on display. As we sat down, the kids were given an activity bag which was a real bag of surprises. Not your usual colouring in/wordsearch with a couple of rubbish crayons that break as soon as you look at them. No, this was a pack that kept the 4 children entertained while waiting for and during the meal. A Chinese fortune teller with a food theme (that actually is still being played with, because this week the girls had a Chinese fortune teller phase, the timing couldn't have been better) came out top for sure. The menu had so much to choose from, and it's so much more than one would expect from an Italian restaurant. With one family member who doesn't eat cheese, we more often than not opt against Italian food, but this was not an issue here at all. The kids menu is great too, and it was really useful that it can be checked out online because a few in our party were running late and it sped up the ordering process. 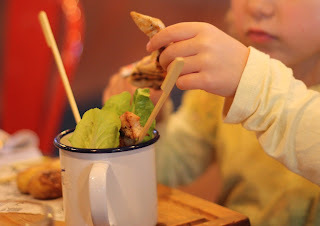 The kids' menu was refreshingly different with simple but good food and a tub of vegetables to go with it. Yes, there was some humming and hoing, what with this being different to the food they are used to, but one of the four got really upset when one of her carrot slices disappeared into the mouth of another, because it was the longest and thinnest strip out of the pot. It was so refreshing to see that kids didn't get a deep fried carbs meal but a grilled, balanced meal with more vegetables than I've ever seen on a kids menu. Best of all, the kids meal was actually free, because kids eat free with an adult meal. Wowser. That makes such a difference. The adults had a wide range of different foods and my goodness, it was tasty. Just the right portion too, i.e. enough to leave space for a pudding, but not too little to leave one hungy if pudding is not required. We spent much longer than expected, which is rare with the kids, usually after about an hour we are keen to leave and give the relevant restaurant a break, but not so here. The kids were having great fun playing together (!) with the activity bag items, and we never felt the urge to leave. I asked my two a few questions about the experience, they were a bit tired when answering so it's slightly monosyllabic. What does Jamie's Italian smell like? Can't remember. Like honey! What did you do until your food arrived? Played games, talked. We played with the play bag, there was stuff you can make and colour in. What was your first thought about your meal when the waiter brought it to you? - Oh no, there's salad with it! Mummy's garlic bread looked and tasted extremely yummy and it was freshly baked bread. What did you eat and how was it? Chicken lollipops and it was good. I liked the way the carrots were cut. What do you think your meal was made out of ? Chicken, salad, vegetables, potatoes. The girls are both big Disney fans. Each has their own favourites, and if I'm sick of reading one book, it must be the Disney story collection which gets pulled out as the bedtime story choice rather a lot. 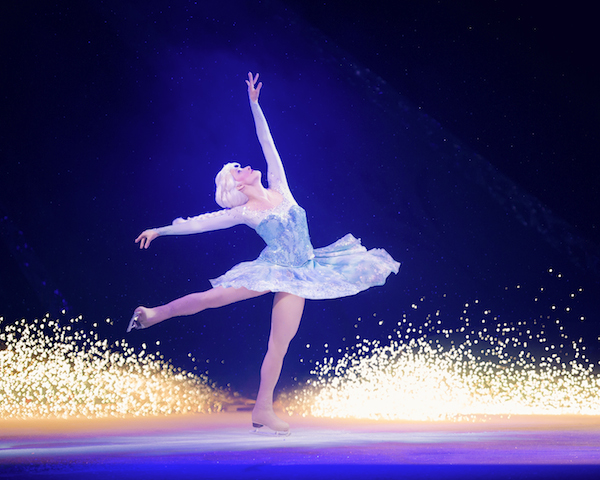 Last year we were lucky to see Disney on Ice and it was a great success, we all really enjoyed the show so we were more than glad to be offered review tickets this year. This autumn's show started off in Braehead Arena, near Glasgow, and will be touring for a good while through major cities in the U.K. As usual, there are 4 Disney films featured and this time it's Toy Story, The little Mermaid, Cars and, of course, Frozen. The venue was a bit smaller than last year, and so was the production. This was not a bad thing, we were so much closer to the ice, so much better able to see the amazing skating performance and the girls didn't in the slightest realise that there were slightly less people on the ice. It was still spectacular, colourful, with amazingly original constumes (I'm still not sure how Ken and Barbie managed to look so like Ken and Barbie as they did!). It was easier to focus on the story, and the characters, although for the adults, there was some compromise in the spectacle. But really, last year's show was a hard act to follow, with all of our kids' favourite films covered. Cars was the one bit that didn't convince, there was no skating invovled, rather a few cars moving rather aimlessly across the ice. Fortunately this was also the shortest chapter of the show. A minor quibble of mine would be that the reduced version of Frozen left my girls wondering where Sven was, and also the story was told in a different way that left some loose ends for the 5 year old. However, as far as I was able to tell, the girls enjoyed it as much as last year's show, and even the initially reluctant and less excited 8 year old ended up enjoying it immensely. The 5 year old was full of praise what a great show it was, so it's definitely a great night out for the whole family. Disclosure: We received complimentary tickets in exchange for a review. I guess it's pretty normal that after years of blogging, sometimes, one feels that there's something like a dead end. It's not that I want to stop this blog, but it feels that what I used it for is no longer what I want to use it for. 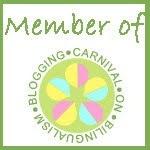 I started out in a previous blog with civil society themes, which are still close to my heart, then became a mum and blogged about the challenges but also the treasured memories. I feel this is harder as the children get older because I have to accept their own wishes and it's clear that Cubling doesn't like being a spotlight. And Snowflake is getting to this age too. As far as other topics are concerned, I feel that there is a lot of noise out there already, so many voices, what could I possibly add? It's not a bout of lacking confidence, just an honest feeling that there are many people out there who are excellent writers and debaters and do the stuff that I would like to do a lot better than me. So I'm looking a bit for a new niche, not a brand (I've never been one for a blog brand, it stifles my writing). I'm not sure where this will lead but I'm glad for anyone who's still with me on that journey. A lot has happened in the time that I've been quiet on this space. I've studied with the Open University for the Certificate in Promoting Public Health. The experience of going back to study was interesting because so much has changed, it's so much easier accessing research these days where everything is digitalised. I enjoyed the course but didn't enjoy having to write quite so many written assignments which meant that the topics I really wanted to study were only side lines to working towards passing the course. If I'm to do any more study, I'd much prefer to study without that pressure, but then again recognised qualifications are what looks good on a c.v. I also trained to become a breastfeeding peer supporter with NCT. I'd always wanted to do this and the opportunity came about suddenly and I embraced it. It took a while to start volunteering and actually be a peer supporter, but it's now happening, just as I'm no longer a breastfeeding mum. The Open Uni course and the NCT training were extremely complementary and both also had very strong links to my work so that I took a lot from it. At work, I'm now involved in two programmes working with families who have children at the transition to primary school age range. This is of course very satisfying at a time when my own children are at that age. The new programme is in the development stage which is rather exciting, and different to being trained to deliver a set programme. Which actually isn't all that bad either. 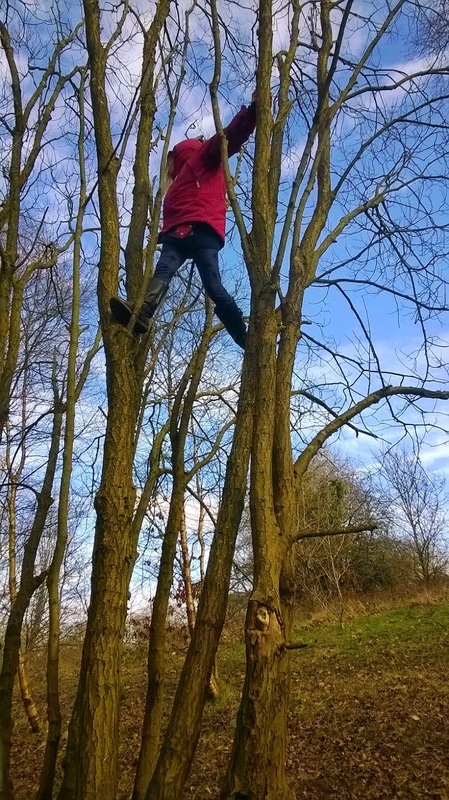 There is also a bit of a shift happening with the children growing and slowly but surely being able to join in with activities that I enjoyed before I had children. Both girls are now cycling and we've started to do short and slow bike rides as a family. This has once again brought up my interest in making cycling safer and more prevalent in a city which is not set up for cyclists. I effectively stopped cycling after a bus hit me while pregnant with Cubling, so it's been a long time with only occasional and short trips on the bike. We've also done a couple of hill walks, no Munro bagging of course, but that suits me just fine. It's just nice to finally find again some of the loose ends of my life before children. During our summer holiday trip to Germany, we retraced some of my own childhood memories and also discovered some parts of Germany that were very new to me. I felt a tourist in my own country. I always find that I encounter strong emotions when I'm in Germany, a mix of homecoming and feeling estranged, which is slightly unsettling. I had taken the whole summer off on unpaid leave to savour the precious last summer before Snowflake started school. And I'll do it again next summer. I'm lucky because my work is linked to school term time so it's actually possible, and the summer went by quickly and without regrets. Well, it may make the transition to a 5 day at school week a bit harder for Snowflake who tells me daily she'd rather go to nursery or spend the day with me. I'll keep doing a good few reviews, simply because I feel they can be useful for some people even if they may not go well with the flow of this blog. We enjoy trying out new places and products (with a relevance to our lives, I have no energy to do reviews of things that I have no interest in). Hopefully with a bit of a stock take, I'll be more likely to find things worth talking about, although these days I'm actually more interested than ever in the debate rather than just putting forward my own views. This might be why I've been on facebook more than here, where there's more interaction and debate than on a blog space. Photos taken on our cycle around Cumbrae Island. Guest review by the one and only Mr Cartside, who, as you will be impressed to see, knows a fair bit of all things techy (unlike me) which is why he got the job to review this USB Wifi adapter. The first thing you notice about the Kinivo wid380 USB Wifi adapter is its distinctive physical form. Two slim arms, initially flush with the side of the device, can be rotated, and positioned independently. Presumably these each contain an antenna, and the idea that by a deliberate separation of the two arms, I may reduce the chances of poorly intersecting the electromagnetic wavefronts, is compelling. Physically, I should also mention a rather nice docking unit attached to an extension cable, which frees the device from the need to stick out the front or back of your machine; and instead sit on the top of it, say. Eventually, this compiled, installed, and worked; though I must say with fairly poor quality, and frequent connection drops. So, that's it. It works fine on Windows and passably on Ubuntu. It even looks good - something I never thought I'd say about a USB Wifi Dongle. Full disclosure: We received the product for review. If there's one thing that sends shivers down my spine, it's the danger of carbon monoxide poisoning. We had gas safety checks and fire safety checks in our house, and each time, it was pointed out that a carbon monoxide alarm would be recommended. Did we get one? Well, eventually yes, but it was one of those things on our to do list for far too long. It's been only in the last 6 months that we finally got around to pick up a couple of alarms to make our house safe. That's 10 years after first being told we should really get them. Every year in the UK, more than 200 people go to hospital with suspected carbon monoxide poisoning and about 40 people die. Small children and the elderly are most at risk, and these are deaths that are entirely avoidable by spending £15 on a carbon monoxide alarm (which lasts around 10 years). Some more statistics: Ini the last three years, an estimated one in six homes inspected by the Gas Safe Register was found to have an unsafe gas appliance and one in eleven has an unsafe boiler. These are staggering numbers, and an unsafe boiler or gas appliance is a carbon monoxide accident waiting to happen. CORGI HomePlan is campaigning for every home to get a carbon monoxide detector which will keep the whole family safe. They are really quite cheap, and you should have one in every room that either has a gas appliance (including gas boiler) or an open fire. Find out more details at their website: http://corgi-homeplan-how-safe-is-your-home.org/ where you can follow advice and be aware of warning signs to look out for. And what's more, I'm giving away a carbon monoxide alarm worth £30. Simply leave a comment below. Competition closes on 12th May 2015. Disclosure: post written to raise awareness of carbon monoxide poisoning, no remuneration received. Detector provided by CORGI HomePlan. 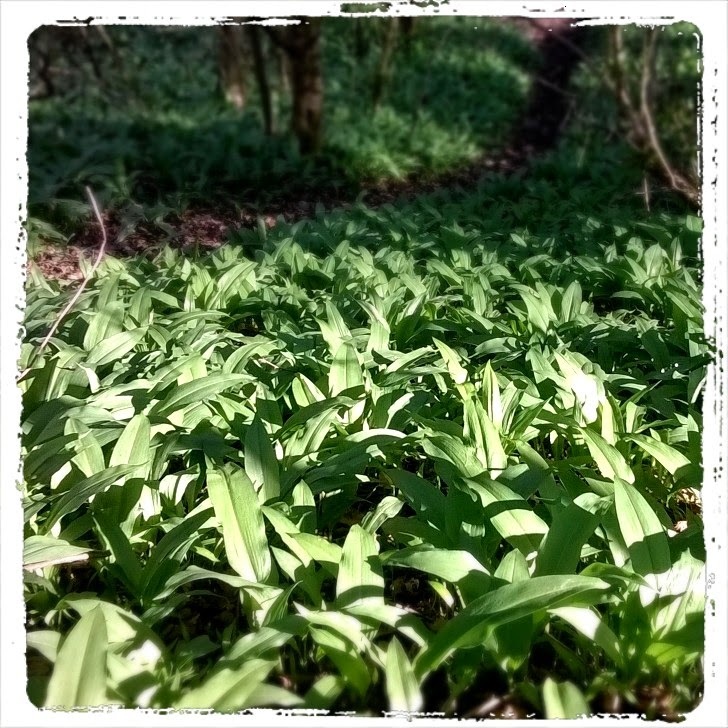 A super easy wild garlic paste which will keep for months in the fridge. Process until smooth and fill into a jar. 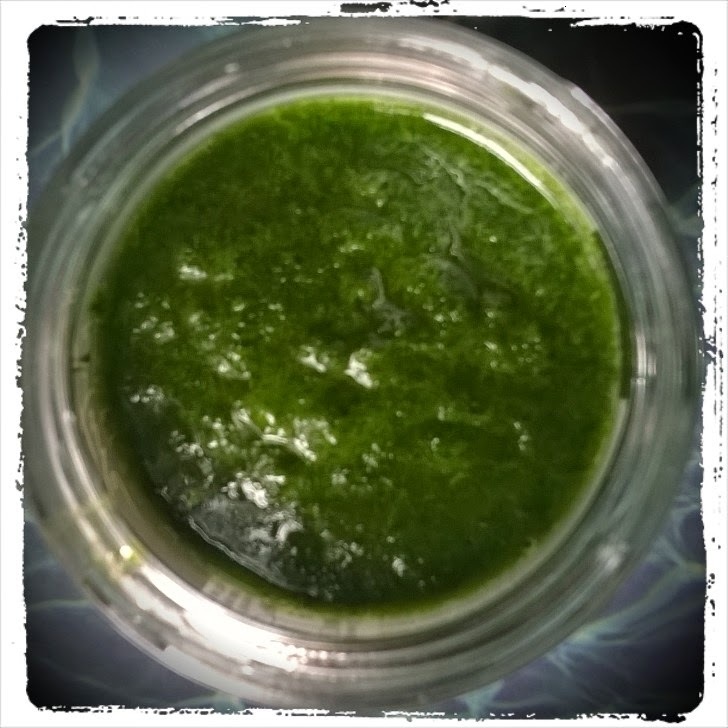 This paste can be added to recipes, you can make it into pesto, use it as bread spread. Of course we had a birthday coming up and so soon after Christmas, I always struggle to find a decent present. So it was great to try out a new toy shop, which like all shops these days, has not just a high street, but also an online presence. Hawkins Bazaar has branches in Scotland and I tested out their range and service in their online incarnation. Hawkins Bazaar has stores in Edinburgh, Dundee and Aberdeen which is a tad for to travel for me. The website is rather intuitive and it's easy to browse and find what one is looking for. I also found it easy to browse if one doesn't know what one is looking for (i.e. me). I got lots of ideas and particularly like the section for party bag items which to me seemed a bit more of the unusual and useful type, rather than the usual plastic tat that doesn't last the day. Particularly there were some small toys that in multiple (party bag) quantities were a very good deal. I'm not quite sure what made the website so user friendly, but my experience was that I found what I was looking for much quicker than in other store websites. 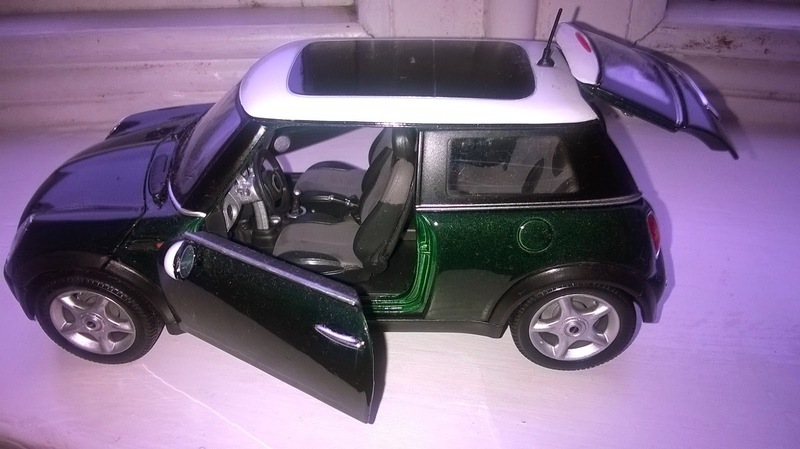 For the birthday child, we got a model mini, because she's just really into minis. The idea seemed perfect, and the mini also comes in yellow, however, it wasn't possible to choose the colour (and the one that came was black, but she didn't seem to mind). 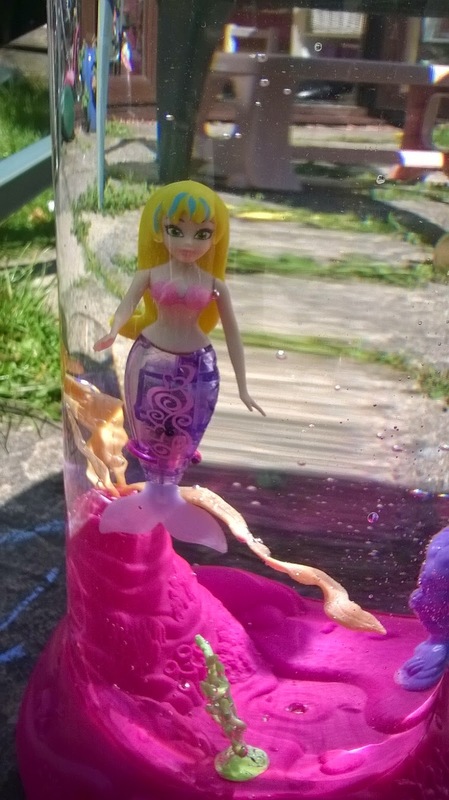 For Snowflake we got a mermaid tank with swimming life like mermaid which she totally adores, and plays with hours on end. It's perfect for the garden and has been popular amongst the neighbour's girl as well. 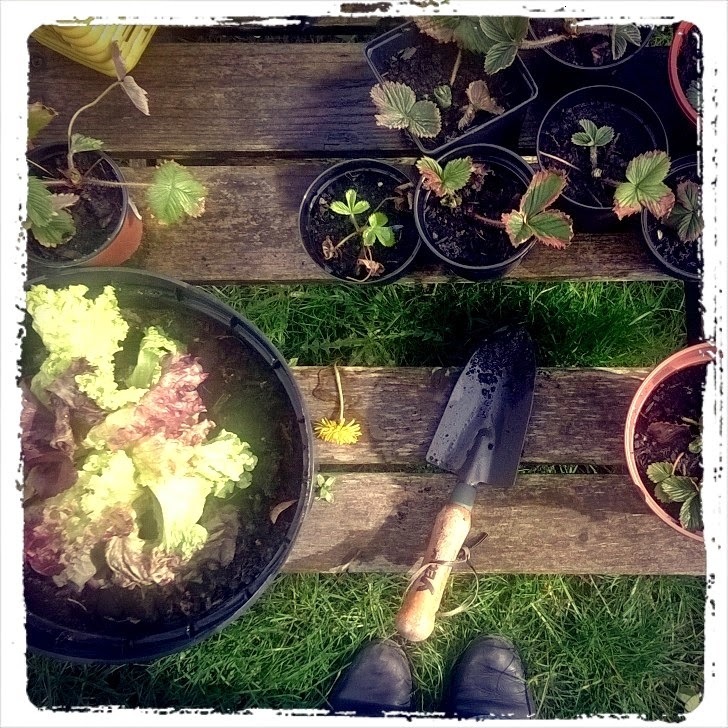 I love gardening. But it's one of the things that often gets pushed down the to do list. With all this spring holiday sun (now gone), there was no excuse. My uni assignments may be late, but my back garden is looking much more like a back garden than the mess it was. This year, I won't be growing much in the line of vegetables. This is because I already know I won't be there to water them for over 3 weeks and the past has taught me what that can do to vegetables. It may rain a lot in Scotland, but there are times when, well, it doesn't. Every single year my poor veggies died of unintended neglect, so I'm going to go simple this year: with flower beds, herbs, lettuce in pots, some potatoes (still chitting), if I can source it, rhubarb (which is a vegetable, so there) and maybe a container growing apple tree. I'd love some rasp-/tay-/black- or blueberries too but haven't been too successful in keeping them alive either, so I'm still a bit undecided. 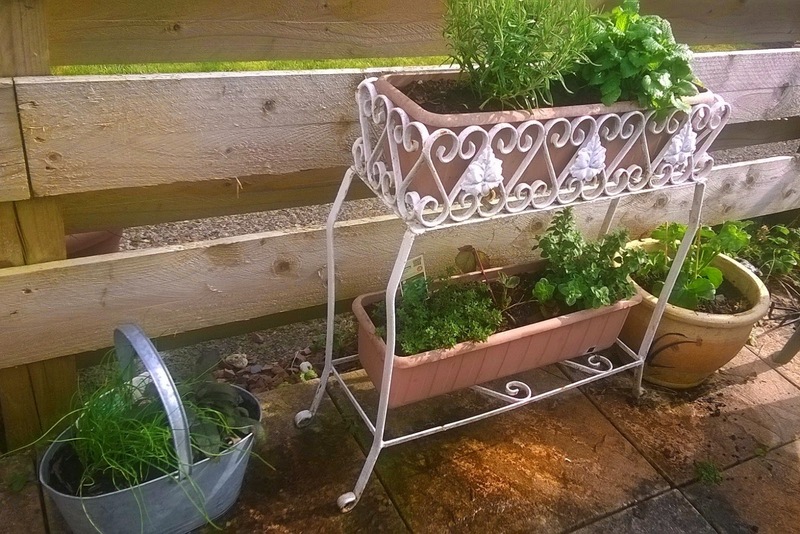 In a small garden where container gardening is the big word, even easy growing plants just need a bit of extra attention. So it's all about low maintenance and nothing that I fret over if it gets destroyed. It also doesn't help that the cats are using the raised beds as their toilet, which I'm told is not particularly good for veg growing anyway. And doesn't give freshly planted then dug over plants the greatest of looks. I filled 2 wheelie bins with garden waste and garden rubbish. 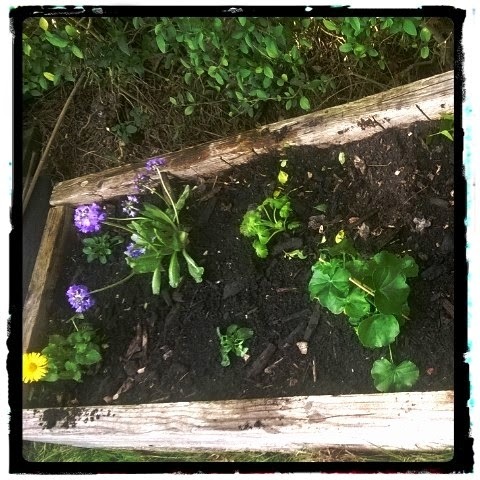 It's rather astonishing how much rubbish and unwanted growth can happen over a year. Of course I'm not finished yet, so bring on more of the warmish weather so I can complete the job. But for today, I'm rather satisfied with our wee back garden. (next time I may even manage to get the herbs actually into the shot, doh). We are currently on holiday, all four of us. Which is pretty awesome - usually the only family holidays we get in a year are one where we go abroad plus Christmas, so to be off and at home is very rare. We have to thank a change of jobs and a change of working hours respectively. So what to do with a precious week off? Not having planned anything and after having been away on a campervan trip so recently, we are keeping it reasonably local. We've explored new places nearby and further away, following recommendations in the main. There is also this rather impossible concurrence of school holiday and good weather. It's been sunny since Saturday, that's 5 days in a row. Nothing can go wrong now. 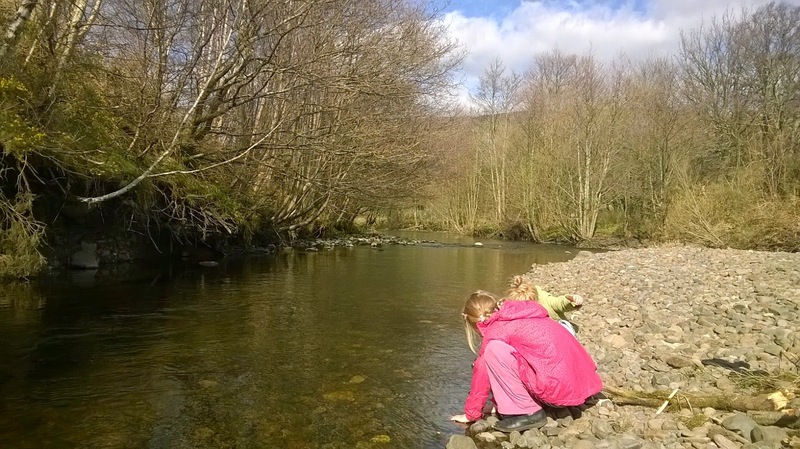 One place we discovered was Fintry in the Campsies, a spectacular short drive away. There is a very cosy bar/restaurant, the Fintry Inn (not to be missed because they have a bike sticking out of the front wall), with very tasty Scottish food fare and a pool table, and a lovely little walk along the river - we didn't get far because the children's imagination at a pebble "beach" took them to imaginary places while their bodies stayed put on said beach. Basically we spent 2 hours on a path that would normally take 10 minutes to walk. It's as if all that winter staying in time had to be balanced out by outdoor imagination all in one go. 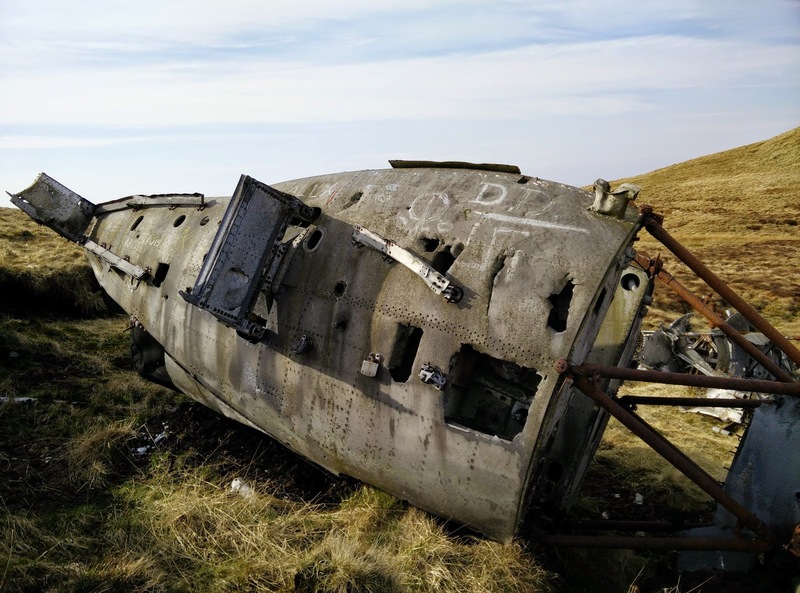 Today Cubling and Mr Cartside went into the hills behind Largs to find the small passenger airplane that crashed on Irish Law in 1948 (miraculously, all 20 passengers/crew survived). We didn't go along because it was a proper hillwalk on boggy terrain, which would not have been fun with a 4 year old in tow. (Snowflake and I went up another hill, with much easier access and the quick reward of stunning views of Arran, Cumbrae, Bute and Largs). 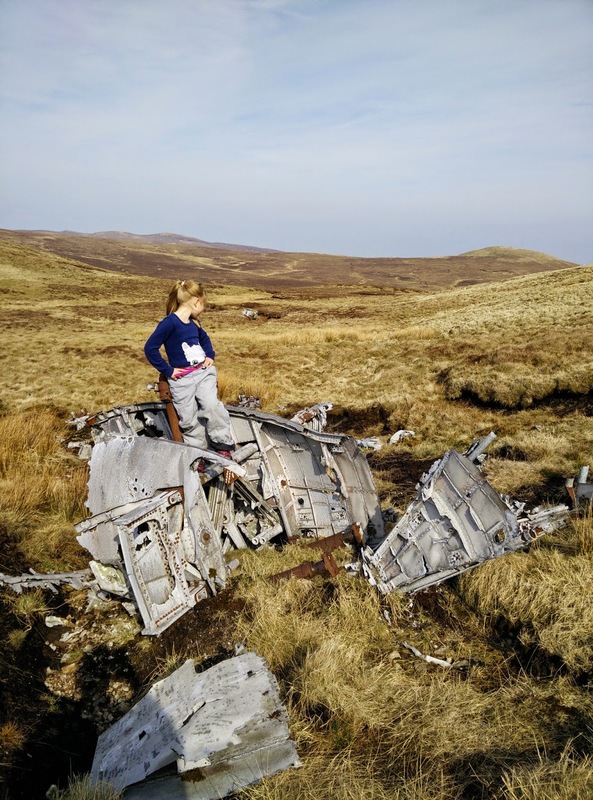 At the end of a day, back came a very muddy child proudly presenting tiny bits of aeroplane that she'd picked up. It was clearly an adventure filled day. 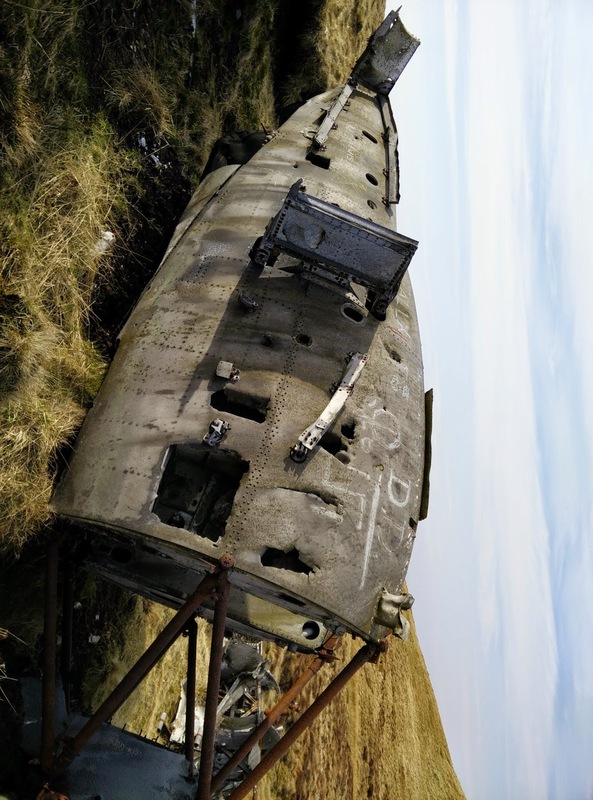 It's astonishing that the plane wreckage is still up there and even more so that not many people outside of Largs know about it. It was something like a real life treasure hunt which made the proper hill walk so much more fun. So here I am, being offered my favourite chocolate (Ritter Sport if you must know) and some lovely Moselle wine to explore how Germany can be a good travel destination. Nothing more to my liking than that! It is a bit strange for me though drinking German wine, which I connect with summer in Germany sitting outside in the sunshine of an early evening, here in Glasgow on a rather dreich and chilly March evening. It's just not the same and it makes me long for my summer holiday which will actually take us to Germany. Germany is not the most popular tourist destination. It's a bit underrated that way. It's a big country with very different regional characteristics, it's by no means a place that can be easily summarised. My parents hail from the Eifel, which is a wine growing region but also makes its own beer, a rural, mountainous and very wooded part of the world which is rather beautiful and very much undiscovered by tourists outside of Germany. The wine, like that of the Rheinland further south, is the perfect drink on a hot summers day, and seriously better than its reputation. I have not had a bad wine in Germany and really don't know where that Liebfrauenmilch myth comes from. My own part of Germany lies 200km further north, just outside of Cologne, a very densely populated area steeped in chemical industry and with the Black Country of Germany next door. And there's beer being made there too. In fact my hometown is on the borderline between two types of beer, Alt and Koelsch and it's really rather important which one you are partial too, and whether you see yourself closer to Duesseldorf, the city of fashion, or Cologne, the city of Tuennes and Schael, comedy, carnival, hard work and hard partying and a rather impressive Cathedral. And we are yet very different from all the other regions, the fishheads of the north (it's a term of endearment, honest) or the south/Bavaria, who drink their beer by the litre (when we prefer tiny 200ml glasses, aka test tubes). And Berlin is of course a world on its own. In our attempt to find a proper holiday destination (in the sense of something that isn't my hometown or one of the fabulous places our friends are from), we have come across a lot of regions to discover. There are canal holidays, the lakes of Mecklenburg, Swiss Saxony with stunning scenery, you only need to drive for an hour and you can discover a slightly different regional identity. Holidays in Germany also mean bathing in lakes, the mudflats of the North Sea, romantic Ruegen at the Baltic Sea, beautiful town centres which are pedestrian and bicycle friendly. The food is traditional still and you'll get your regional fare anywhere really, it's only the big cities that have the usual multicultural variety of cuisines available. Which means that yes, as a vegetarian, it can be a bit of a struggle, because it is true, Germans love sausages. But there are also foods which have rarely traveled and really should have, take Spaetzle, or the amazing varieties of German bread. In fact, start any German expat on the topic of bread and you'll not hear the end of it. The great thing about a German holiday is that it's not geared up for mass tourism and isn't pretentious and also doesn't capitalise on what it has to offer. It's all a bit understated, as if nobody really thinks that anyone would even consider coming all the way from where ever to visit Germany - we certainly had a decent amount of disbelief on our farm holiday in the Eifel, where people wondered in amazement why we would travel so far for this kind of holiday, not understanding that actually, it's a pretty amazing idea to live on a working farm and have the opportunity for the children to see how it all works, as well as daily pony rides through the beautiful German forests. vineyards of this Moselle wine region, providing plentiful opportunities for tastings along the way. A full selection of holidays in Germany is available too. What's best is that I can give away another set of 2 bottles of tasty German white wine and a couple of bars of the most delicious Ritter Sport chocolate to a lucky winner. Please leave a comment on here, and share this giveaway on facebook or twitter with #MyGermanDiscovery @cartside for an extra entry each. Giveaway closes 10th April. (Open to residents of the UK only sorry). Disclosure: we received German wine and Ritter Sport chocolate to join in the #MyGermanDiscovery campaign. On April 5th, in just a few days, the right to shared parental leave will be coming into force. This is something that has been around in other countries for a while. In Germany, its uptake has been pretty good and lots of dads appreciate the opportunity it gives them to spend quality time with their children in the early years too. When I speak to parents here, many are skeptical about uptake but at the end of the day, one can't take it if it's not an option, so having the option is a first step, it gives food for thought and a choice that wasn't there before. If you were wondering what it's all about and how to take advantage of it, GoToMeeting has a useful infographic available which explains in a nutshell everything around shared parental leave in a very easy to follow way. A useful too for anyone considering to apply for shared parental leave. Last weekend's campervan trip was of course not enough to celebrate Cubling's 8th birthday. Thanks to free tickets we had the great opportunity to see Disney on ice and review it. An extra special birthday treat and a great night out for the family for sure. I was actually quite surprised how excited the girls were about the night, and both of them in equal measures. There was a lot of talk about which characters would be there and what it would all be like, 4 year old was so excited that she wouldn't even have a late afternoon nap (which she usually has whether I like it or not, and which would have helped to get her through the long evening). I was bit suspicious about the venue, the SSE Hydro, which has let me down before with rather poor viewing, but when we took to our seats I knew that this wouldn't be an issue. The ice rink was positioned in a way that it was easy enough to see and the distance and height actually helped to appreciate the formation skating. The show came in two halves which I felt were perfectly timed, with an intro and then 2 retellings of well loved Disney stories, The little Mermaid and Tangled before the break and Beauty and the Beast and, of course, Frozen after. The stories were abridged and came with all the best songs from the films. The outfits were anything from stylish to funny - I had rather a lot of fun with Sebastian the crab and Magnus the horse, and the seahorses that came out to dance were rather breathtaking too. It was a visual feast and with ever more "oh look, it's ...!" For Snowflake, it was the bestest selection of storylines anyway, as she is heavily into Tangled and Frozen, and likes the other two as well. A fair bit of pyrotechnics added more wow factor to it, and there was even a moment of being rather scared (in spite of the distance to the action and being reasonably high up, which I guess speaks for the way that the show did spark the imagination of little ones). The props and set were clever and at times rather beautful too, the ship for the Little Mermaid stood out for me as looking extremely realistic in spite of being only a tiny boat part, and the lanterns from Tangled had all the magic they promise to be. With the finale of Frozen, all our favourite songs were present and it Snowflake was singing them at sotto voce (much to the dismay of her big sister). I think I was also the victim of having little hands put in front of my mouth as I'm quite party to singing along. I have to admit that I missed bits of the show because the girls were so delighted that I couldn't help but watch them instead. Like Disney or not, it was a great show with lots of visuals, great music, tongue in cheek and all the hallmarks of great entertainment. The young audience was all dressed up and enjoying themselves brilliantly (as were most of the adults). There was a fair bit of souvenir and marketing stalls which I'm not a great fan of but we did find it easy enough to avoid and at least we didn't experience much pestering. The show was captivating throughout, both my 8 year old and 4 year old were equally enchanted and in spite of it being well past their bedtimes, they followed every single move. The show is part of the Magical Ice Festival tour and you can catch it in most major UK cities in the next few months. Which left me with just a cake to make for her ceramic painting party at our local Glazed on Saturday. This year's chosen cake theme would have to be Okami, a Japanese video game which Cubling has been playing with Mr Cartside since Christmas, it's all about a spirit wolf called Amatarasu who fights for good and feeds the animals in the spirit world. 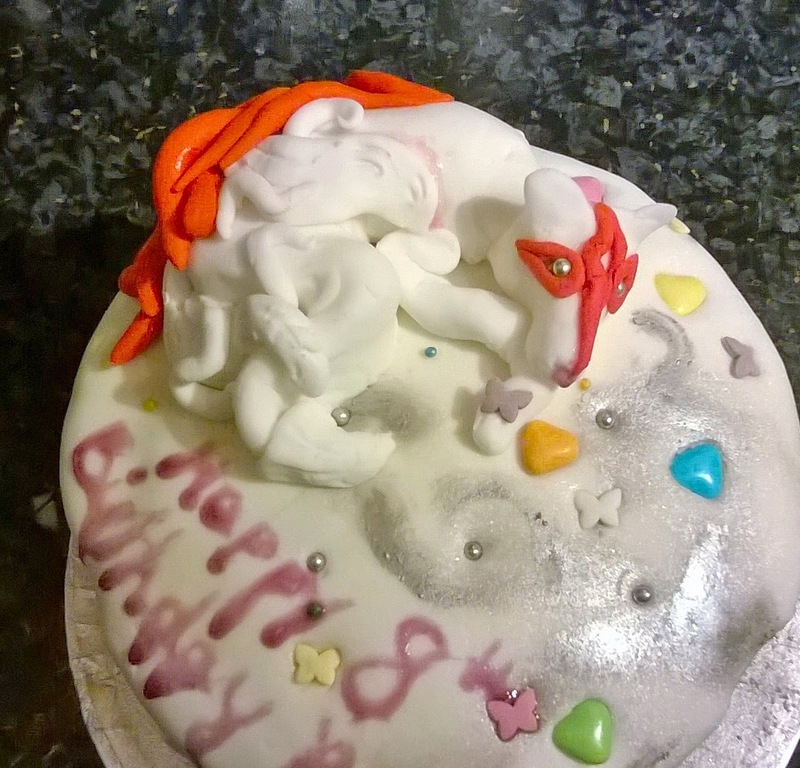 I don't think there's many Okami cakes out there, enough though to copy it from a more talented cake maker and icing sculptor than myself. Cubling was pleased which is the main thing. One of these days I'm going to find out how to make a symmetrical cake too. In the meantime, we're munching my assymetrical cakes which at least taste just as well, so there. There's something about turning 8, Cubling looks really grown to me now, as if she's now at an age where she's getting ever more responsible. It feels odd to be a parent to an 8 year old when it really only seems like yesterday that she was born. A cliche I know but oh so very true. We received free tickets for Disney on Ice in return for a review. All views expressed are that of the cartside household, which is slightly partial to all things Frozen in its entirety. Tomorrow my big girl will be a big 8. And the best birthday present came a bit early, in the form of our first ever trip in a (hired) campervan. I'm not quite sure where her infatuation with campervans comes from, not that I don't understand it, after all it smells of adventure. So we went up to Perth (with a stop en route to watch the solar eclipse through a thick layer of cloud) to pick up our campervan from Big Tree Campervans for 3 days and off we went, without a plan and the Highlands right in front of us. We didn't stop in Dunkeld - I love this town so much that we probably wouldn't have left if we had, and we didn't find the picnic place I had in mind, so by the time we had lunch, we were in Pitlochry where the fish ladder that we had stopped to see was unfortunately closed for the week. Not to worry, the birthday girl was loving watching the fishermen and soon was found digging for worms (pst, the fishermen didn't want her worms, but fortunately she didn't notice). Having had 3 recommendations for a campsite in Aviemore, we decided to head there. A quick stop for a food shop and an outdoor jacket (we had filled our small car with stuff, but had managed to forget the birthday girl's jacket which really is kind of essential). Our first night was spent at Glenmore, a camp in the forest site, with owls and woodpeckers to keep us company at the lochside beach, to the backdrop of the snow covered Cairngorms. I was pleasantly surprised that campervans have heating, for all my love of the outdoors, I really don't enjoy being cold at night. The first day took a bit of getting to used to the campervan (it helped once we figured out that lifting the roof made cooking much easier), and the girls loved their den in the roof. My good plan to work on a certain Open Uni assignment or do some crochet after the kids were asleep were rather a no-goer, because I fell promptly asleep. 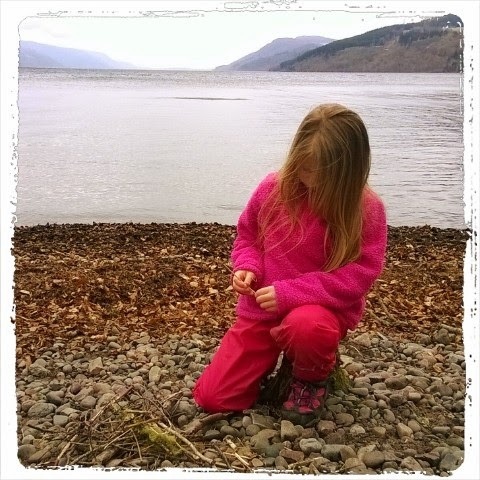 The next morning, after a fun filled trip to the beach (it involved water dam building, tree planting, making a see saw, balancing on logs, duck and dog watching), we surprised Cubling with our newly hatched plan for the day: visit Loch Ness. She had done a massive show at school last year all about Nessie and we knew this would be a winner, and so it was. The weather was amazing, blue skies and the first warmth from a tentative spring sun. We had lunch at Urquhart castle car park, and probably didn't get thrown off because it was off season. The visitor centre was arranged in a way that there was no access to shop, cafe or toilets without paying in, but thankfully they let Snowflake use the toilet anyway, and I shouldn't grumble as they left us in peace to cook up our lunch. Next stop was the Loch Ness Experience, another money making endeavour, which wasn't really worth the price tag. The girls were engrossed in the cave like set and videos with special effects, and clearly enjoyed it. But £8 for adults/ £5 for kids to watch 6 short videos and for the privilege of entering a massive souvenir shop? (not toilets again by the way) I wasn't convinced and wouldn't recommend it unless your child has done a school topic on Nessie. We decided to head for the Loch Ness Shores campsite south of Loch Ness, which we later found out has only been open for 19 months. The road took us through Fort Augustus, which is a beautiful and sleepy place at this time of the year, and a stunning road through the mountains, past peat bogs, mountain lochs and stunning landscapes, possibly the most spectacular scenery of our trip. The campsite is located in Foyers, which is a village carved into the mountain, with an upper and lower part to it. The following day we would explore the breathtaking waterfalls and the cosy cafe at the waterfall with seriously good food and incredibly thoughtful service by a lady who in another place would probably have been retired 20 years ago. The campsite was quite different, modern facilities and not as spectacular as the forest site of Glenmore, but run by a couple who were clearly interested in the welfare of their customers and made sure to find us the best location with easy access to both playpark and toilets. Yes, there was a playpark on the site, which was great, as well as lots of different walks along Loch Ness and into the steep hillside that connects lower with upper Foyers. And what does my almost 8 year old want most? A campfire (not allowed on site but allowed at the shore). Stick with "old man beard" were collected, because no adventure is complete without a fire. Oh, can I see a monster shape coming out of the water? It was a long drive home - and we went past so many places that would merit a visit. I'm sure we were all in our heads plotting our next trip, whether with campervan or wigwamming it, youth hostels or picking one of our favourite locations and looking for accommodation nearby. I felt quite apprehensive about a campervan trip, not ever having done it before, and we didn't go the whole way and camp in the wild this time. I was surprised though that it was easy enough to cook simple foods in the van and that it was more comfortable than imagined, the bed didn't give me a sore back, and eventually we had all our stuff organised in a way that was not the total chaos of the first night. What I particularly appreciated was the brilliant communication by the rental company, their excellent customer service (in the good sense, I didn't feel like a serviced customer, but like someone just made absolutely sure that I had the best possible time on my trip), and who can argue with finding 4 fresh eggs from the rental company's hens in the fridge? I also really liked the fact that Big Tree Campervans are based in Perth, which is the best starting point for any Scottish holiday (well, ok, maybe not for Dumfries) and they even valeted our car while away (I almost didn't recognise my car it's so shiny and clean!). And to Cubling: Happy 8th Birthday my tree hugger, fire maker, Nessie spotter, worm digger, dam builder, cartwheeler, tree climber, adventure lover! You keep me on my toes which is just as well! You know that sinking feeling, when there's just too much to be done and you find yourself on facebook far too much because the mountain is just too big to tackle? Well, it seems my open uni course is moving too fast right now to keep up, throw in a 4 day work training in Cardiff, a child's birthday, a campervan trip, home being redecorated and it feels like the sky is falling down (and I now it's just an acorn, and it'll pass). I was trying to take it all in my stride, forgetting my clumsy big toe, until just before I got home from Cardiff, on the finishing line between Glasgow Central and Cathcart, where I fell spectacularly into the train. Heavy rucksack on my back, heavy case clinched in my fist. I was a turtle on her back just that I had fallen flat on my front, the Kafkaesque person metamorphosed into a bug and unable to move. Yes, I needed the help of a young gentleman to get me off the disgustingly dirty train floor, and my shins knew it had been a bad fall. 4 days later and it seems I managed to give myself whiplash because that pulsating headache, neck ache and shoulder ache is just not shifting. I was far too embarrassed to even make an attempt to thank my knight in shining armor and feel awfully guilty about it. Am I using this as an excuse to postpone my uni assignments or am I really struggling here? I don't know, I just feel catapulted at top speed through my life and all I want is for it to stop and slow down. It would help even if I didn't end up quite so tired at the 9pm spot when the kids are finally in bed, with a brain unable to do any studying. It's rather clear that this excursion to student life will not continue, 9 months of it is enough (6 months at this point). A bit like pregnancy, I remember vaguely I had more than enough at the 6 month point. Snowflake really cheered me up by drawing a sad face and telling me that would be me if Mr Cartside, Cubling and Snowflake were dead. Top marks for empathy, bottom marks for making me miserable. But on the plus side, she loves me more than Elsa, which in 4 year old terms is probably a massive declaration of love. And she made a dalmatian so all is well. This week had a special treat in store: We were off to see Mulan the Musical at Glasgow's Fruitmarket. The Chinese production by an all female dance company cast retold the legend of Mulan with percussion and acting, transcending language barriers while still celebrating Chinese culture and heritage. We were very lucky to be offered review tickets, and I'd shown the girls in advance the trailer and told them the story of the girl who protected her ailing father by pretending to be him and joining the army to fight in his stead. The performance was breathtaking, the drumming was superb and so were the visuals. With great costumes, great acting, a bit of audience participation, and bit sized pieces that made it easy to follow the story, it was very much a production that appealed to young and old alike. Links had been made with the Chinese community in Glasgow and many schools had school classes in attendance so that it felt very comfortable to have taken out young children to a school night performance. Snowflake's best friend is Chinese and it even turned out that she had seen it too, possibly even on the same night (though we didn't bump into her) so they had a lot to talk about the next day! I thought it was great for Snowflake to learn a little bit about the cultural heritage of her best friend (they have already exchanged languages, her friend teaching her Mandarin and Snowflake teaching her German). And Cubling was more than excited about it all, impersonating the percussion even before we went to see Mulan. I felt quite privileged to be able to see such an extraordinary performance right at my doorstep. This was the last performance on Red Poppy Percussion's European tour but considering the performance was sold out, I can't but hope they'll be back really soon. We received free tickets for the show to review it. 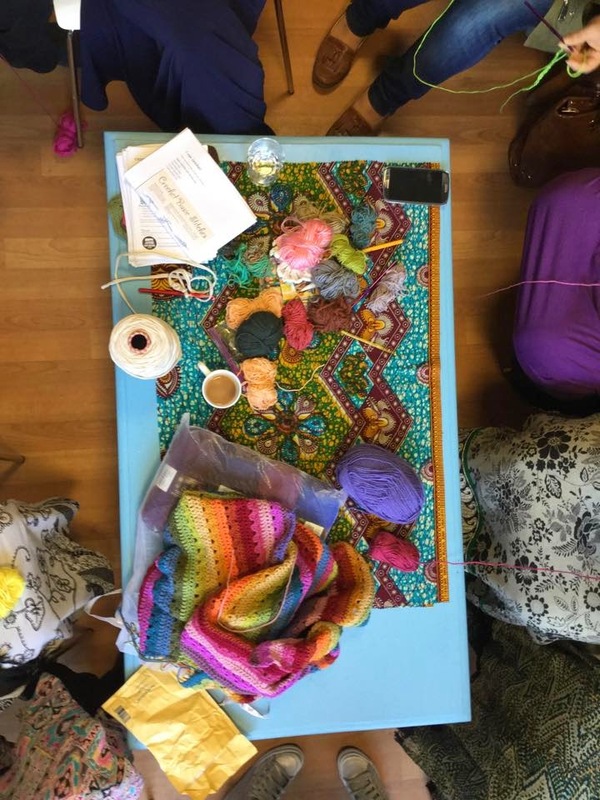 Thanks to a friend whose children attend Glendale Primary School in Pollokshields, an area of Glasgow that is not all that far from where I stay, I found out about the Glendale Women's Cafe, and was asked if I'd be interested in doing a few crochet workshops there. After the first attempt had to be cancelled due to unforeseen circumstances, it finally happened in the last 3 weeks. The Glendale Women's Cafe started out in a portacabin on the school grounds, a place for mums to meet. Now the cafe got some funding and is in a proper nice shop front with quite a decent amount of space. There's always cake, and lots of interesting activities. The area is quite multicultural, and so is the cafe. So I popped in for 3 crochet workshops while friends of mine were kind enough to take my own preschooler to the German playgroup. I'm by not means an expert on crochet, but after a couple of years of regular crochet projects, and with a memory of how I struggled a fair bit to learn it well enough to be a contender with knitting projects (I've been knitting for as long as I can remember), I thought I'd at the right place to try and pass the crochet love on. Mind, I volunteered so nobody could sue me for being a fraud. And it was just great fun. I approached it with not assuming at all that everyone would progress at the same rate - there's individual differences, some people knit or have done some crochet in the past which makes progress a bit faster, others have little ones that mean they cant' pay full attention, others only joined in session 2 or 3, some were able to practice at home others weren't, and while I had a rough idea what I would cover when, I let the rest just happen. It was great to see so many people who came along for some crochet, the 10 hooks we had provided were soon gone and had to be replenished, as was the yarn. I loved to see that by session 3, there were still about 10 people with hooks in their hands, and some finished or almost finished products! And thanks to facebook I've even seen one finished project which puts my crochet work totally into the shade. Some of the ladies even passed on their new skills to their own children, so there's rather a lot of crocheting going on in Pollokshields! Beyond my wee workshops, there are a lot of other activities on offer, art workshops, home energy advice, complimentary treatments and lots of links to community organisations and the services they offer. A brilliant project, all run by parents for parents, with the goal to increase community cohesion. I was a little bit jealous that our primary school doesn't have a similar cafe, it's just such a brilliant idea to create some community spirit by giving parents a space to meet and connect. I have a a confession to make. I've never ordered in a pizza. Yes. That's right. There are reasons for this - cheese may be one. (there is a family member who won't eat cheese, unless it's cheese cake or crisps, or ... but generally, no cheese) But even when I was single, it never occurred to me to order in a pizza. My children are a well of information and so I know that other families have things like Friday pizza night. How very curious. Of course, they have been pestering until my ears fall off a tiny little bit to live up to the Jones' so when we were offered to try it out with the money on the PR company, I knew that I couldn't deny my sprogs the excitement of the Friday pizza night. And guess what? You can order without cheese (though personally, I don't quite see the point of pizza without cheese, but hey that's another blog post)! Not being used to ordering pizza, and being a perfectionist (ahem), it took me about an hour to select our perfect meal. It also appeared that there were special deals on and it was all quite complicated to make sure that we got all the deals and paid every penny of the maximum amount given to us. It got a bit ridiculous and under normal circumstances, this process would have taken a few minutes max. However, the whole family enjoyed being able to order their very own special pizza (rather than being presented with the healthy stuff mummy usually decides to cook without proper consultation) - which was made possible by a range of sizes, one pizza with 2 differently topped halves, and a family where every person eats exactly what nobody else eats. I mean, we could have just ordered one massive pizza that everyone ate and paid half, but no no no, that wouldn't be us. Fortunately the choices on the order site were endless and pretty easy to make (although with all our toing and froing, an edit function for pizzas already in the basked would have been useful). 3 pizzas it was, one with two different halves, one without cheese and one for me. Throw in some of my favourite ice cream and a starter to share and we were all pizza'd out (and didn't manage to eat it all, so we got two meals out if really). Delivered to our door, no cooking required. Some fun family games were thrown in, and the kids loved being able to run about and not sit at the table for once to stick the nose onto the clown (not part of your usual Domino's order). And to turn their parents until dizzy to see them stick the nose miles away from the clown. We had a great night in. Oh yes, the pizzas were pretty yummy. I'm told there's a Domino app to order now as well. Apps are a bit advanced for me, and I have an odd windows phone, where most apps don't work, so don't know about all that, but I'm sure the young ones will love the app. Jee, I'm hungry now talking about all this pizza. full disclosure: We received a set amount to buy anything from the Domino's menu and £5 Amazon vouchers for buying apps, the latter I spent on a nice CD instead, making Bruce Springsteen a bit richer. I'm clearly showing my age here. She's so tiny, the size of a 3 year old, and I can't get my head around that she's even able to cycle, and that she learned it so quickly as well. I guess we're all set for our summer cycle around Cumbrae then! Here's to the end of bike seat and hello trailgator/trips to the park for a wee cycle. She was very keen to let her grampa know on the day (he is a keen cyclist) and can't wait for getting a start for it at nursery. Her joy was quite something to witness! It's the time of learning how to cycle again. It was pretty straight forward with Cubling, but Snowflake likes her balance bike and isn't all that keen just yet, although I have a feeling it won't need much practice to get her pedalling about. We'd heard about this organisation called Freewheel North, both from cycling enthusiasts with children and it's also kind of right next to my work and I'd passed it on my lunchtime walks. So we took us there one Sunday afternoon because that's when they have a family session (on dryish days). 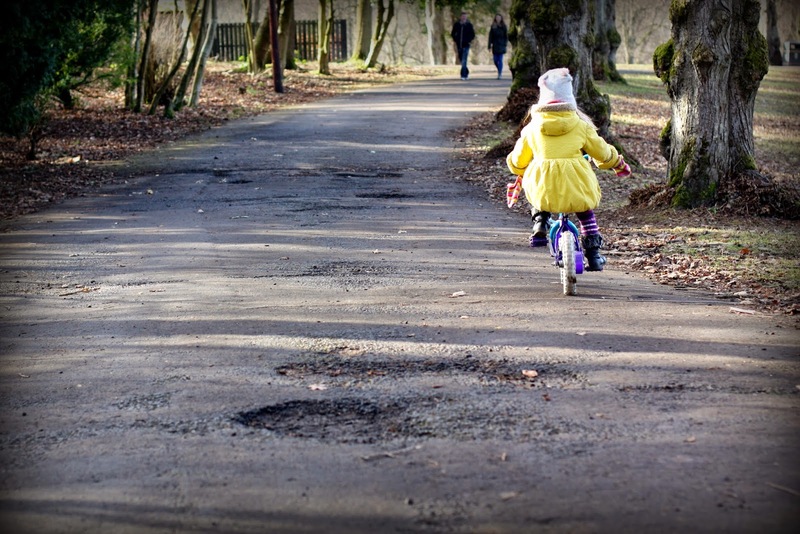 It's a simple enough idea, there's a small path network just for bikes and a whole range of pedalled vehicles, and kids can have a go on as many as takes their fancy, for the cost of £1 per person. Freewheel North also runs sessions for disabled people and people with additional needs during the week, so there are lots of accessible bikes as well. We had amazing fun - first in the family bike (for 4 people, only the back row pedals, clearly the girls loved being moved about by us), then on go-carts, different bikes and balance bikes. There is a mud track too which Cubling was plainly in love with. It was just brilliant to have a decent track which was totally safe and fun, without any worries of traffic, pot holes or children entering the roads. A fab introduction to cycling for sure. It was very inclusive because of the variety of bikes and other vehicles, there's something for every age and ability, including wheelchair users, and looking around it was great to see both people with special needs and those without cycling together. Cubling even made a friend and was off on a 2-person go-cart with her. The staff and volunteers helping out were amazing, really making sure everyone had a good experience by choosing the right sized bike and knowing the basics for operation. 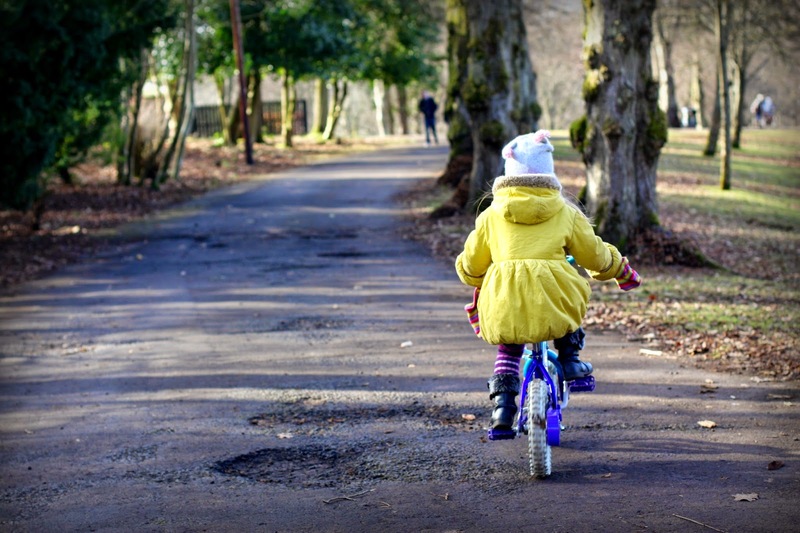 And what's more, Snowflakes confidence has really come on, we're still not close to cycling but she's now happy to pedal with just someone holding on to her jacket, so it actually worked to build confidence and move us on a few steps closer to the future of family cycling tours. Freewheel North also offers led bike rides. They are based at Templeton Street on Glasgow Green, right behind the adventure playground. It's pretty obvious that I've more than slightly withdrawn from blogging, other things have become more important and admittedly, I may have that sort of midlife crisis where I really wonder what I could possibly add to the debate when there's plenty of articulate people out there, would anyone really want to read what I have to say? At the same time I've been busy. After almost losing my job once again (the joys of the voluntary sector where even a permanent job is not particularly permanent), I managed to reduce my working hours to something resembling a work-life balance (I now work 3 days a week term time, at least until Snowflake starts school, which is in September. What happens then, I don't yet know but it doesn't worry me too much), I signed up for some courses. At the Open University I'm working towards the Certificate in Promoting Public Health which won out of 10 different modules/courses, because it didn't just sound super interesting, but it also led to a qualification within 9 months which sounded doable. And if that wasn't enough, an opportunity presented itself that I just had to go for, and 3 months of training later, I am now a breastfeeding peer supporter with the NCT. Which actually fits in incredibly nicely with my course of course. And with all that public health talk, it's high time that I did something about my health, and so I'm on course to move from totally sedentary to moderately active, and enough weight lost to no longer be in the obese category which I know means a significant lower risk of a whole lot of illnesses. And then there's the stuff that was kind of always on my to do list and got pushed back by procrastinating on blogger, facebook and whatever else presented itself on the computer. There's a whole pile of books that's been waiting to be read, yarn wanting to be turned in to garments, and it's not that I do much more of it, but even that tiny amount of reading and knitting/crochet simply wasn't happening when all I did every evening was blogging. Somehow, that's no longer attractive and that's ok. It's also getting a bit tricky these days exploring the challenges of parenting when your children are growing and respect and confidentiality are more important. 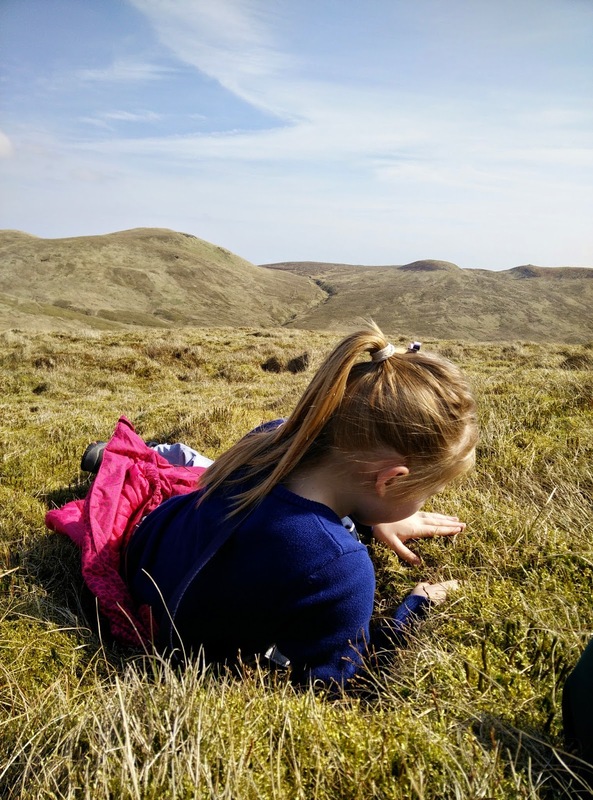 So much of this blog was about the thinking that was triggered by new challenges, and to some extent I don't feel like baring my soul or "using" my experiences, and with them, my children, in that way. It just doesn't feel right. It may be time to introduce Cubling to blogging and involve her in it in some way because she's pretty inspirational. I know I'm biased. But giving this space up completely? I just can't consider this at all. So here it goes, a little toe in the water, a little update for those who may not know (because truth be told, I've not told many people what I'm up to these days). So hello there, I may be back.